Full script system to quickly build a game with Turrets, Projectiles and Explosions of all types. Using the Coffee Auto Patcher enjoy the peace of mind of instantly uploading patches to your File Host containing only the content that has changed. Coffee Auto Patcher comes with Unity and WPF Auto Patchers. Coffee Auto Patcher will work with any CDN and comes with a full guide for using Amazon S3. 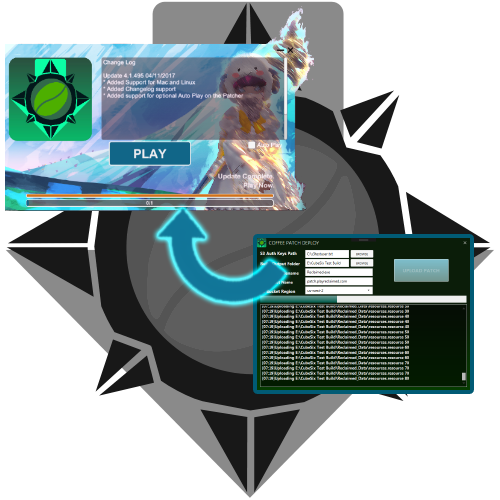 Your game client will launch the patcher only when a new patch is available and update for your players automatically. Focus on the gameplay alone while CoffeeBns handles the deployment process. and Reddit for any questions, comments or suggestions. HOW DO I CONTACT YOU FOR CONTRACT WORK OR EMPLOYMENT POSITIONS? I am always available on email at [email protected] and Twitter to discuss any contract work or employment positions. I am available for remote work or near San Diego, CA or willing to relocate to the Seattle/Bellevue area. All original content on this page is © 2017 Coffeebns.com® and may not be used or reproduced without consent.